Each holiday season I start off with a sincere plan to make tasty care packages for family and friends. But my plans are often sidelined by other distractions—a baby on the way, my mom in town, and a book about to be published—and there doesn't appear to be a spare moment in sight. The good news is that there's an abundance of really delicious, healthy treats that can be scooped up and sent off to loved ones with the click of a mouse. And in light of the belt-tightening times, all of these are under $100. For earth-conscious chocolate lovers, the Bento Goodie Box ($79) from Viva Terra is a home run. 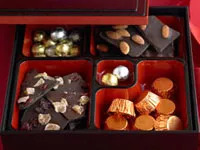 Not only are all the decadent chocolates organic, but the bento boxes can be reused for holding jewelry or cuff links, or for post-holiday portion-sizing. The beautiful box contains cranberry-ginger bark, peanut-butter cups, roasted-almond bark, and festive foil-covered chocolate balls. For healthy cooks, a high-quality olive oil is a welcome gift. Hand-harvesting of olives (as opposed to machine harvesting, which can be damaging to the fruit) makes all the difference in the quality of olive oil. That's why Round Pond's Italian Varietal ($26) is so fantastic. It has a wonderful, fresh, intense flavor and is fantastic in salad dressings, drizzled over grilled fish, or in dips and tapenades. For those trying to be virtuous (we all know a few), you can't go wrong with organic fruit. A basket of seasonal fruit won't lead anyone down the gilded path to naughtiness, and it's nice to have on hand with guests popping by. Filled with USDA-certified organic pears, apples, oranges, grapefruit, and a bonus seasonal fruit, the Organic Fruit Banquet ($65) comes in a lovely reusable basket. For friends who just got pink slipped, help fuel their job-search with Dean & Deluca coffee. The coffee gift set ($48) includes a 1-pound bag of earthy Ethiopian, mellow Breakfast Blend, nicely balanced House Blend, and Espresso Blend for those all-nighters. And if you're the one who just got laid off, you may want to go with a single 1-pound bag ($15). For friends who entertain over the holidays, a jar of June Taylor Quince Paste ($20) is a thoughtful gift. All of Taylor's preserves are outstanding (especially anything made with citrus), but the quince is perfect for throw-together tapas parties. Quince is a classic accompaniment for Spanish manchego cheese. And while most quince is made into a solid block (aka membrillo), this more spreadable version comes in a jar. For everyone else, here's the perfect sweet treat that helps a wonderful cause. After her son Liam was diagnosed with neuroblastoma, my friend Gretchen started Cookies for Kids Cancer to help raise funds for pediatric cancer research. You can send the irresistible trans-fat free, all-natural cookies to friends in great flavors: Chewy Oatmeal Raisin, Chunky Chocolate Chip, or Liam's Lemon Sugar ($30 plus shipping). I know that's kind of steep for cookies, but you're not just sending a baked good—you're also contributing to a worthy cause. And the donation is tax-free.